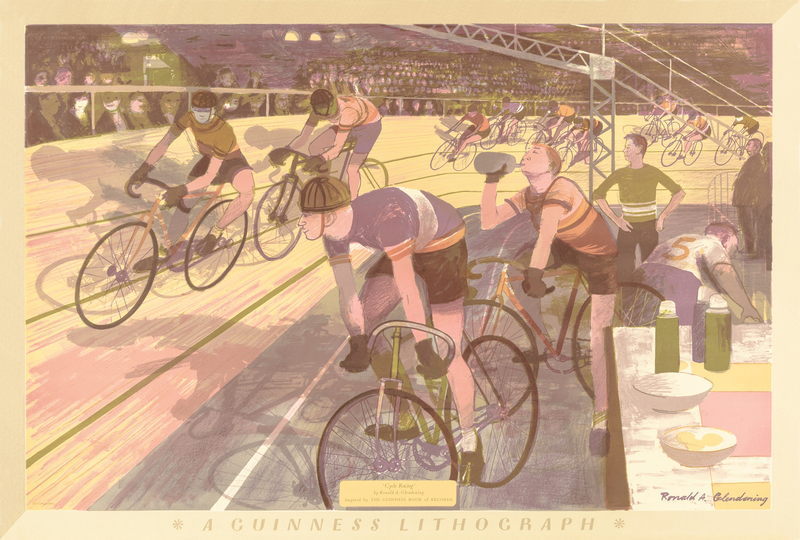 This week I’m reflecting on one of Pallant House Gallery’s latest exhibitions ‘Prints for the Pub: Guinness Lithographs’ with my old friend, Simon Lay, at the award winning pub, The George at Burpham, near Arundel. 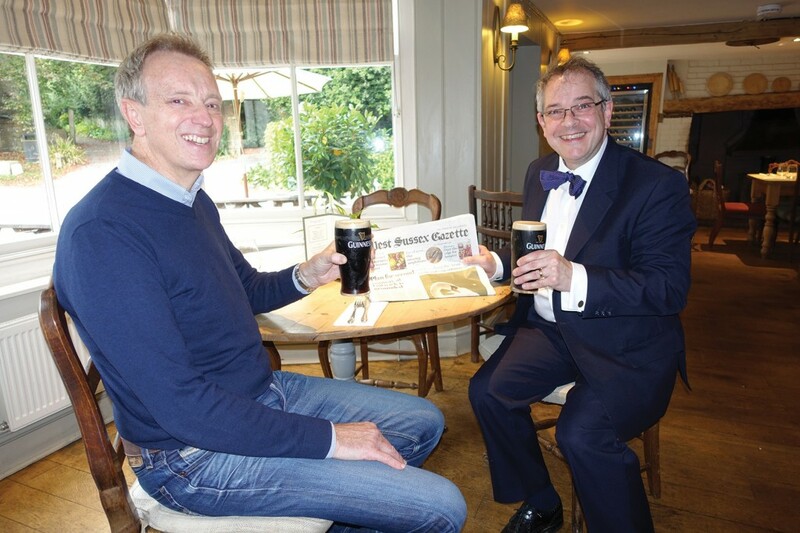 As he approaches the bar I call out “Mine’s a Pint!” Simon dutifully returns with two beautifully poured pints of Guinness, they keep an excellent cellar at The George at Burpham, and we begin to discuss this joyful exhibition. I explain how in the middle part of the 20th century a quiet revolution took place where the auto-lithographic print became recognised as a popular art form – it represented the democratisation of art, especially in the post-war era. After the slump of the 1930s and the Second World War there was a movement to give legitimacy to the voices of the working classes which, in art terms, required a return to a form of social realism. The movement began with the Contemporary Lithographs (1937-1938) but it was the success of the Post Office Marketing prints which, in 1934, led the Department of Education to persuade them to provide a free periodic issue to schools. They were advised by Kenneth Clark, the then Director of the National Gallery, and the leading Art Critic, Clive Bell. A number of leading British artists produced work for the project. It is a measure of their success that 20,000 schools applied for prints. 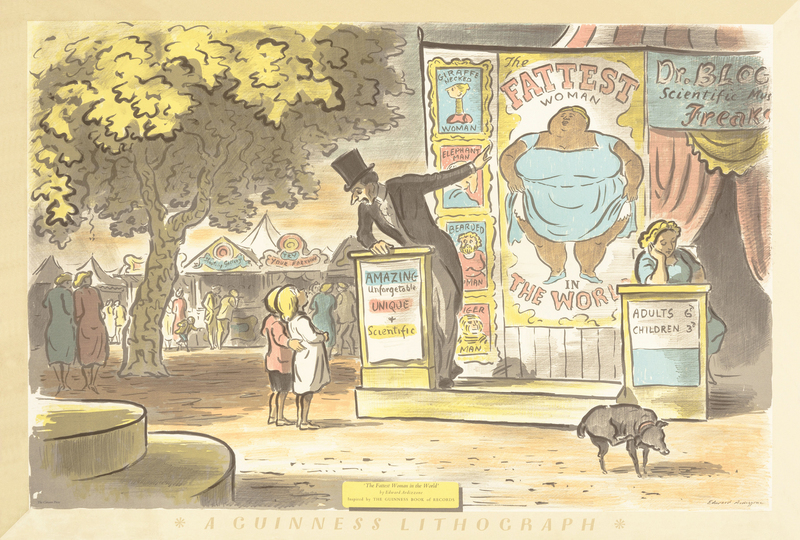 The subjects of the Guinness prints on show at Pallant House reflect many of the same themes. They were launched in 1956 and each illustrated a record from the Guinness Book of World Records. They were intended to be hung in pubs to promote Guinness and their new record book. Once again many leading British artists were involved. Our conversation turns to the prints and the delight to be found in their witty subjects and observations. Simon and I have heard many a tall story in the pub over the years; recalling Bernard Cheese’s ‘A Fisherman’s Story’ causes us to smile. Edward Ardizzone’s fond but rather politically incorrect print, ‘The Fattest Woman in the World’, gives a window onto a scene now long past. In contrast Ronald Glendening’s ‘Cycle Racing’ with its velodrome and speeding cyclists seems very contemporary. Now that winter is drawing in what could be a more perfect outing than a visit to Pallant House Gallery followed by lunch or supper at The George at Burpham. 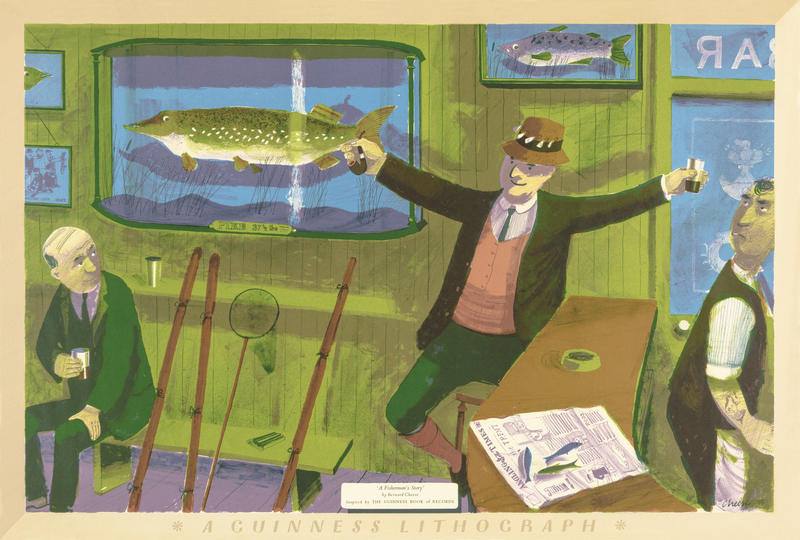 ‘Prints for the Pub: Guinness Lithographs’ runs at Pallant House Gallery, 9 North Pallant, Chichester, PO19 1TJ, until 15th January 2017. Thanks to the generosity of sponsors De’Longhi entrance to this joyful exhibition is free. For more information telephone 01243 774557. To find out more about The George at Burpham, Burpham, BN18 9RR, go to www.georgeatburpham.co.uk, or telephone 01903 883131 to book your table. It’s a great place to stop and rest with your copy of the West Sussex Gazette! By Rupert Toovey, a senior director of Toovey’s, the leading fine art auction house in West Sussex, based on the A24 at Washington. Originally published in the West Sussex Gazette.